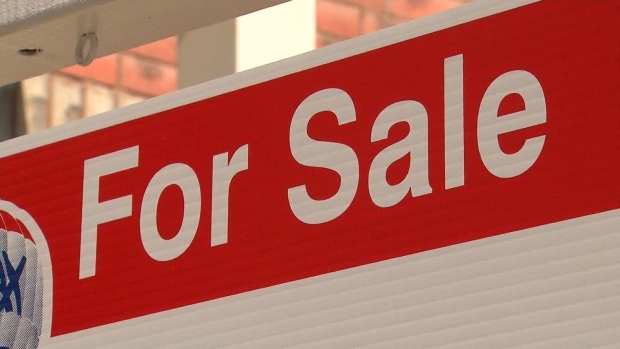 The Canadian Real Estate Association is now expecting an even bigger decline in home sales this year as the latest statistics showed the crucial spring homebuying season came to a lacklustre end in May. The industry association which represents about 100,000 real estate agents across Canada said Friday is forecasting home sales this year to fall 11 per cent compared with a year ago to 459,900 units this year. This downward revision is from the 7.1 per cent decline the association forecasted in March. CREA said the decrease reflects weaker sales in B.C. and Ontario, amid heightened housing market uncertainty, provincial measures aimed at cooling the market, high home prices, supply shortages and a new mortgage stress test introduced this year. The stress test could have a heightened impact going forward since the central bank metric used to assess homebuyer's eligibility inched up, raising the bar higher, said CREA's chief economist Gregory Klump. "Now with that qualifying mortgage rate having crept up ... the stress test is expected to have a more binding impact," he said in an interview. The updated forecast on Friday came as CREA reported actual home sales in May hit a seven-year low as they fell 16.2 per cent compared with a year ago. The national average price for homes sold in May was just over $496,000, down 6.4 per cent from a year ago. Excluding the Greater Toronto and Greater Vancouver areas, the average price was just over $391,100, down two per cent. This drop in sales activity capped off the key spring homebuying season, as March, April and May are typically the most active months in any given year. National home sales activity in March and April were down 22.7 per cent and 13.9 per cent, respectively, according to CREA numbers. The association on Friday again pointed the finger at a new stress test introduced at the beginning of the year for uninsured mortgages, which has cut the amount that certain homebuyers are able to qualify for. "The stress test that came into effect this year for homebuyers with more than a twenty per cent down payment is continuing to suppress sales activity," said CREA President Barb Sukkau, in a statement. As of Jan. 1, the Office of the Superintendent of Financial Institutions requires buyers who don't need mortgage insurance to prove they can make payments at a qualifying rate of the greater of two percentage points higher than the contractual mortgage rate or the central bank's five-year benchmark rate. There was an uptick in sales at the end of 2017, as buyers looked to lock in mortgages before the revised underwriting guidelines took effect. The bar was raised even higher in May when the central bank's five year benchmark rate rose from 5.14 per cent to 5.34 per cent. The Bank of Canada uses the posted five-year fixed mortgage rates at the Big Six banks to calculate the benchmark rate. The central bank's benchmark rate increased, in turn, after all the Big Six banks raised their posted five-year fixed mortgage rates in the preceding weeks, reflecting the higher borrowing costs associated with a recent rise in government bond yields. Despite the double-digit decline, CREA's latest figures support the notion that markets are stabilizing after the volatility at the beginning of 2018 related to the tightened mortgage rules introduced on Jan. 1, said TD economist Rishi Sondhi. "On balance, this was a better-than-expected report," he said in a research note. "Sales were effectively flat during the month -- their best turnout so far this year. Meanwhile, listings increased for the third time in four months, pointing to somewhat improved confidence on the part of sellers as prices edged higher for the second straight month." CREA said it is expecting home sales activity to "strengthen modestly" in the second half of 2018, even though interest rates are expected to rise further. It takes about six months after a new policy change for homebuyers to re-examine their options under new parameters, said Klump. "They have to go shopping again in a new price point," he said. "In part, the modest improvement in the second half of this year reflects the lifting of that uncertainty, as people re-evaluate how much a mortgage they can qualify for, what homes are in their price range." Also, in the large markets of Toronto and Vancouver, demographics such as strong immigration will continue to support housing demand and a modest recovery in the coming months, said Robert Kavcic, senior economist with BMO Capital Markets. "The underlying fundamentals are actually quite still strong ... Eventually we're going to bottom out and see sales push higher again, but not to the kind of frothy levels we saw at one point in 2016 and later in 2017."